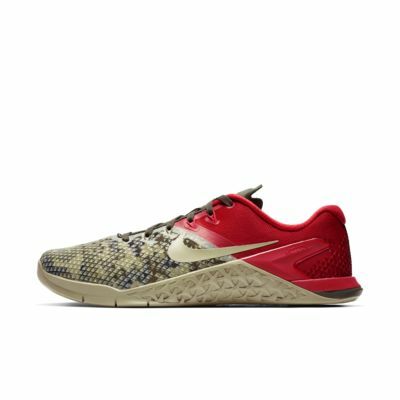 The Nike Metcon 4 XD provides a stable base, flexible support and extra durability for a wide range of training activities, from sprints and sled pushes to lifting and rope climbing. A new textured mesh makes it stronger, lighter, and more durable than any Metcon—ever. This edition is more durable than any other. An 3-D print reinforces the shoe from toe to heel — so it won&apos;t wear out before you do. Lightweight mesh fabric is breathable. Laces engage Flywire cables around your foot for a strong, secure fit. TPU heel counter provides stability for lateral movements like side lunges and shuttle drills. I'm all about function and form, and I almost never review anything without putting it through real life. I made my own pattern because I'm not as loud as the standard color schemes. I was a huge fan of my last pair and the gum soles; not so much on this pair. If my last pair was a good tan, this pair is the end of winter lack thereof. Everything else is rad, but Nike needs to learn about all colors, not just the loud ones. Maybe the soles will get darker the more I use them in the sun. Great shoe for metcons and weightlifting. I would recommend this to anyone that doesn’t have a wide foot. The shoe runs a little narrow. If we could get a little more arch support in the next version it would be perfect (would also help with running). My only concern is that I have owned every version of Metcons to date (1,2,3,4, and fly knit 1 & 2) none of them stay tied. Can Nike please fix this problem going forward?? ?